I enjoy this movie. That was a surprise because as you guys know, I'm not a huge fan of this franchise. I like the book, but for the movie? I just... don't feel it. The reason why I watch the movie because first, Theo James and abs. Second, I love Shailene Woodley. Third, I like the book. 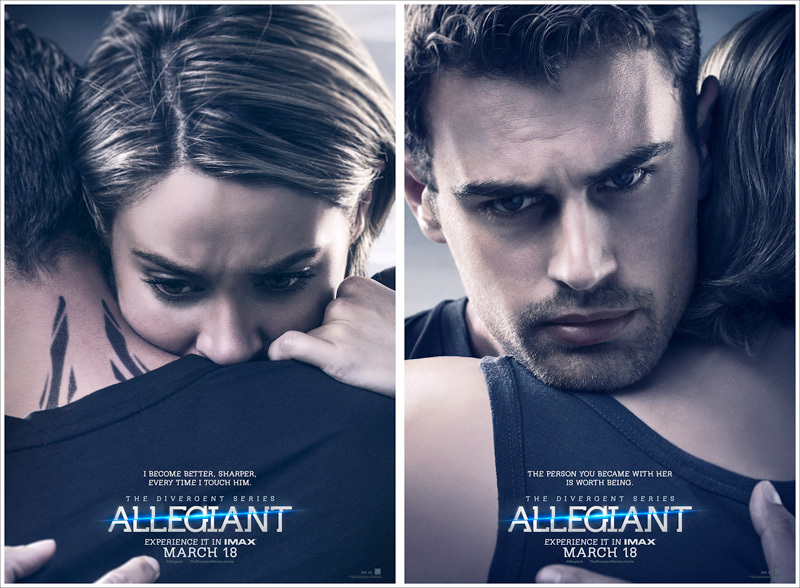 Allegiant is the third book of the Divergent book series by Veronica Roth. This author known as killer in Divergent fandom because... yep. This is also the third movie of this franchise. Personally, I think this movie way better than the first two movies. The story is deeper and clearer, more action scenes, more Four's perspective and of course, he is so damn hot you guys! It started good, two sides fought for control and power, different definition of justice from Evelyn's and Johanna's point of views, every character had amazing development throughout three movies, every relationship, apart the differentiation between the book and the movie, I'm okay with it. I think it's fine and pretty cool actually. The plot took time few days or weeks after Insurgent, focused on civil war at Chicago and the whole experiment at the world behind the wall. The idea of futuristic technology was actually on point. The cast did great job. All the new characters were interesting and played such an important role even thou it was only small part. The chemistry between Shailene and Theo was beyond amazing, are we sure there's nothing between them? mm... fandom says differently. But, again, the special effect was still kinda terrible at some points. I mean, since the first movie, this franchise never had good quality of special effect, always had flaws and very obvious to notice. It happened again and again that was one of reasons why some people hate this franchise. However, Allegiant managed to increase the quality, even some of scenes still very bad and still had cheap CGI. Sorry, but that was true. You can see on the first Milles' scene. Really bad. I also see nothing inviting about this movie toward the second part of Allegiant called Ascendant. For those who don't read the book, this movie is the end of the franchise. It doesn't give any hints for Ascendant. Overall, I can say this is not an amazing one but definitely not a bad one. This quiet entertaining, can't take the whole as a serious one. Well, have to say, main reason is because Theo James. That's why.